One of the most famous towers in the world is the Leaning Tower of Pisa in Italy, Europe which has defied gravity over the centuries. 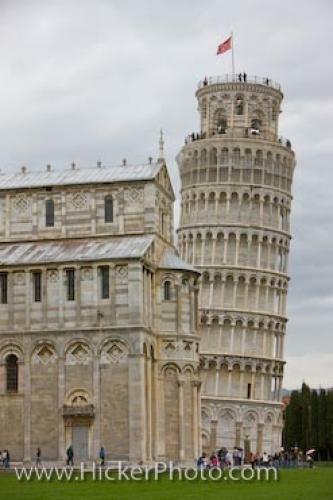 On August 9th, 1173, when architect Bonnano Pisano began construction of the Leaning Tower of Pisa in Italy, Europe it was supposed to be an elegant bell-tower for the Cathedral (Duomo) beside it. By 1178, as the third floor was started, the foundation seemed to be sinking, due to an unstable water soaked clay soil. As the people of Pisa were fighting with neighboring towns (Genoa, Florence and Lucca), the tower project was forgotten for a century, which gave the soil time to settle. In 1272, Giovanni di Simone decided to build the next floors higher on one side than the other to compensate for the lean. Pictures from photo gallery "Tuscany Pictures"
This picture is part of the photo album "Tuscany Pictures" - there are more beautiful images waiting for you. ... 97 degrees, the top is 12 feet 10 inches off vertical. The climb of 296 steps is well worth the view and it is quite a thrill to be at the top of one of the most famous towers in the world. The famous Leaning Tower of Pisa and the Pisa Duomo in Piazza del Duomo (Campo dei Miracoli), a UNESCO World Heritage Site, City of Pisa, Province of Pisa, Region of Tuscany, Italy, Europe. I photographed this photo with the digital SLR camera model Canon EOS-1Ds Mark III, aperture of f/5.0, exposure time of 1/200 sec. on ISO 100, as always I used a original Canon Lens, the focus lenght for this picture was 85mm.